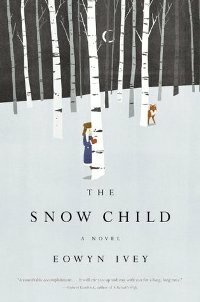 The Snow Child turned out to be a lovely, whimsical read and a perfect pick for the month of February. If you are looking for a book that is life-changing and earth-shattering, this is not your novel. But, if you want to immerse yourself in a story that will leave you gratified, this is it. Mabel and Jack have recently moved to an Alaskan homestead in hopes of a simpler life. They are childless and begin to feel like something is missing in their relationship until the first snowfall of the season, when they venture outside laughing and playing, eventually building a snow child. She is complete with blonde hair, a knitted scarf, and matching wool mittens. The next morning the snow child is gone, but small footprints can be found from where she was built leading into the woods. The Snow Child is inspired by a Russian fairy-tale of the same name. One of my favorite things about this book was the winter imagery. Ivey's picturesque winter landscape makes to want to move to a homestead in Alaska, far away from civilization so I can experience the pure beauty that this novel evokes. Considering I'm not really the outdoorsy type, that says a lot. It's clear that Ivey is quite familiar with snowy landscapes, as she was born and raised in Alaska. I also found it interesting that when the "snow child" speaks, her words are not marked by any quotation marks. This device lends itself to a further sense of mystery surrounding the child and an added since of delicacy and quietness. 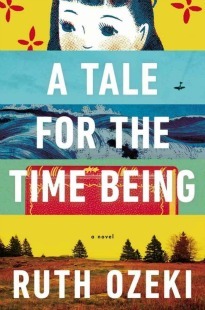 I felt that overall, the fantastical elements in this novel are subtle enough to feel like they just could be real. Mabel was no longer sure of the child's age. She seemed both newly born and as old as the mountains, her eyes animated with unspoken thoughts, her face impassive. Here with the child in the trees, all things seemed possible and true. As I mentioned above, this novel won't knock your socks off, but it is a sweet story. It is well-crafted and beautifully written, seamlessly pairing the realistic with the fantastical, the ethereal with the ragged. There is a strong since of place that permeates the entire novel so if you do read this novel, I urge you to read it in the winter months. Eowyn Ivey is a bookseller in Alaska. This is her first novel. I have the net galley of this one but wasn't sure about it because I'm really not into magical realism or any of that. But if it's subtle, it might be something that I like. I like books that give a good sense of place. I don't even think I would go so far as to categorize this as magical realism. You should give this one a try. Looking forward to this one. It's on my immediate TBR, so we'll see how long it really takes for me to get to it! I've been seeing this book around and it sounds like a story I would enjoy. Great review! This kinda sounds like the un-creepy version of Beloved .. but different. Haha. If this comes to my library I'm all over it, but it's not one I want to read so much that it's worth buying. I love books in Alaska though. I would agree it's not worth buying (said the girl who bought it) but it's certainly worth reading. I hadn't thought of any parallels with Beloved but based solely on it's premise I can now! I enjoyed this book too - it's such a beautiful, magical story. I loved all the winter imagery and the cold, snowy atmosphere. Yes the atmosphere was one of my favorite parts. A copy of this just showed up at my house. I was really drawn to the cover, and I like fairy tale rewritings a lot. I'm glad to hear you liked it. Lucky! I wish books like this would just show up at my house :) How do you make that happen? So I finally purchased it this weekend in St. Louis. Exciting!! Looking forward to discussing. Yay! I can't wait to hear what you think! Some questions about reading, answered. Ryan Gosling works in publishing.